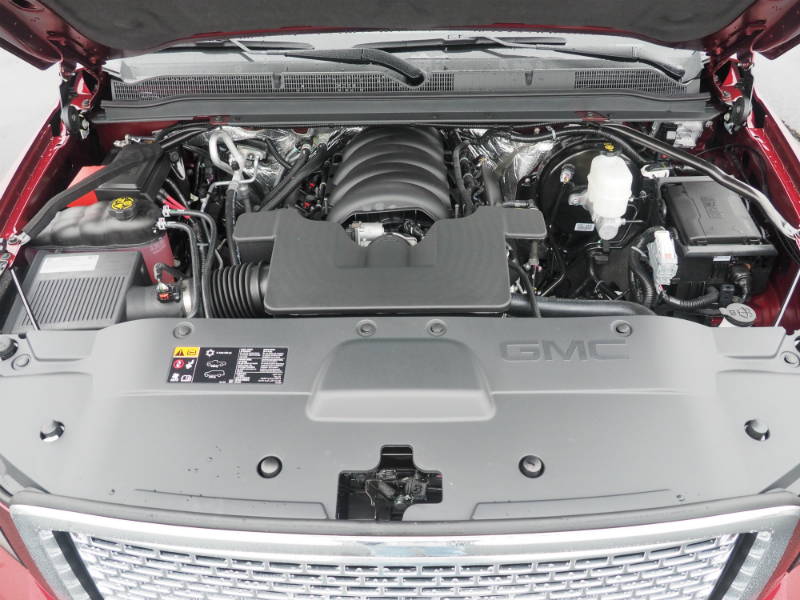 In a world of car-based crossover wannabes, the 2016 GMC Yukon Denali remains truck-based and more luxurious than ever. 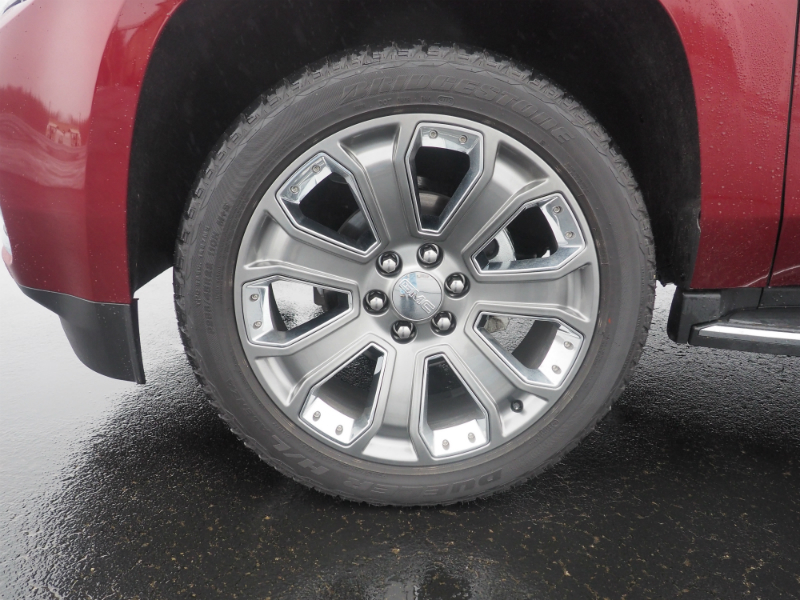 The 2016 GMC Yukon is offered in two wheelbases, whether in the fancy Denali trim or the lower-priced SLE or SLT. “XL” notes the extra length. 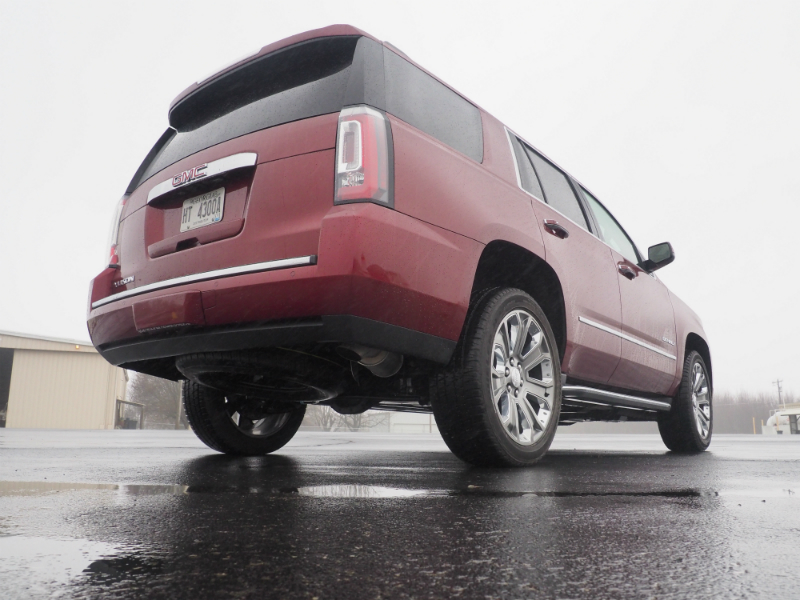 We drove the short-wheelbase, non-XL version. 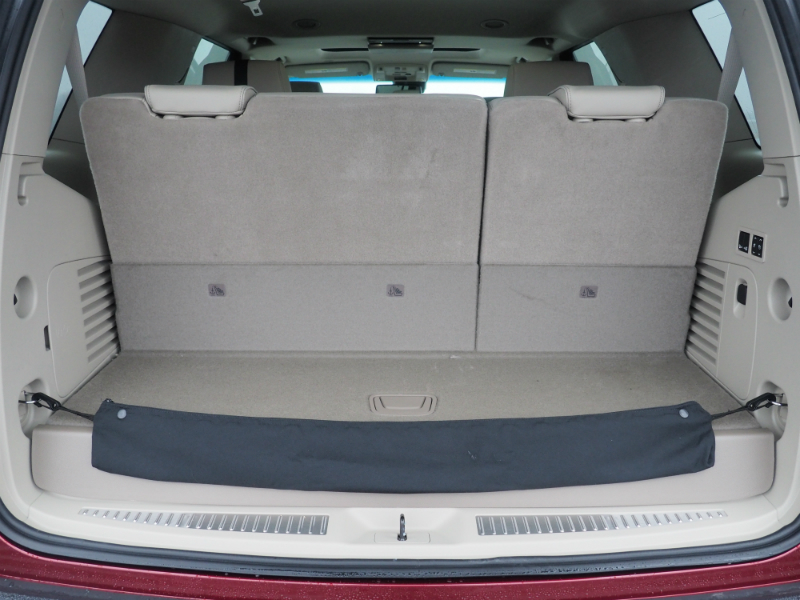 There were still three rows of seats, but cargo capacity shrinks when the third row is in use. If you’re comfortable towing a trailer, this will be of little consequence given the truck-based bones beneath all the Yukon Denali’s luxurious, leather-covered innards. 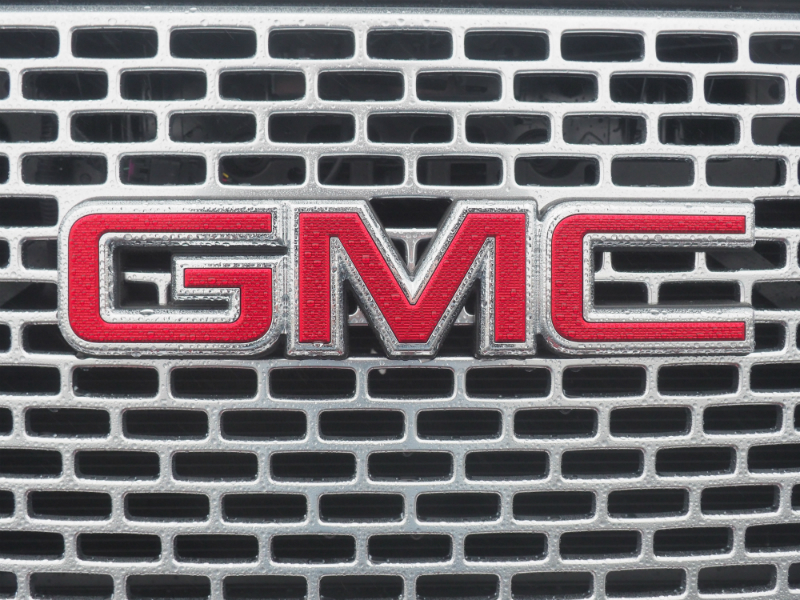 This bad boy can tow up to 8,100 pounds, according to GMC. Of course, those trucky bones also beget trucky size, but there’s built-in help when it’s time to park it. There are parking SONAR sensors and a backing camera that is displayed with nice clarity on the eight-inch GMC IntelliLink touchscreen in the center of the dash. The truck-based powertrain was most welcome during my test week, when Tennessee saw its biggest snowfall of the season. I was able to traverse questionable driveways and unplowed backroads with ease, thanks to the 4×4 system. 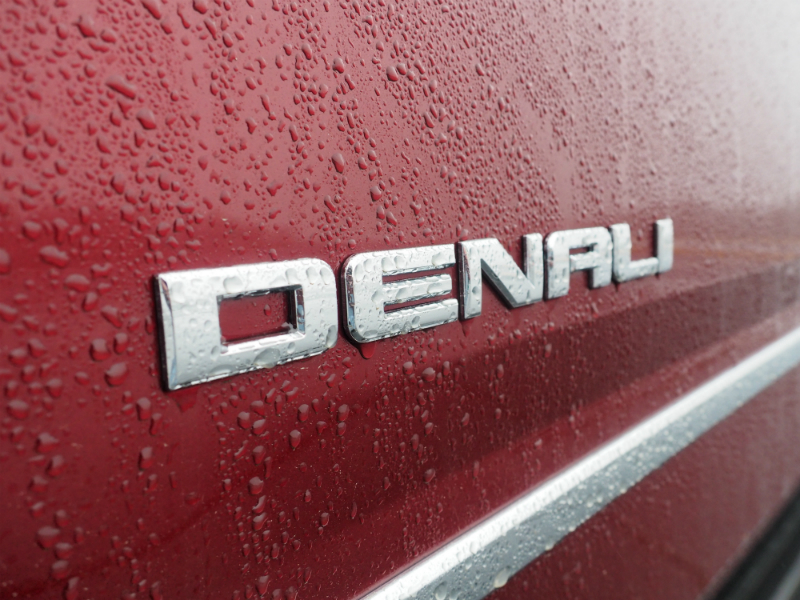 The 6.2-liter gasoline V8 is the sole Denali engine offering, and it makes a confident 420 horsepower and 460 lb-ft of torque. It pairs well with the eight-speed automatic transmission, which made it easy to dial in the perfect amount of power in slippery conditions. I criticized the Yukon’s baby sister, the V6-engined GMC Terrain Denali a couple months ago for having slow throttle tip-in, but precise throttle control is the flipside of that criticism and is most welcome in snowy, icy stuff. 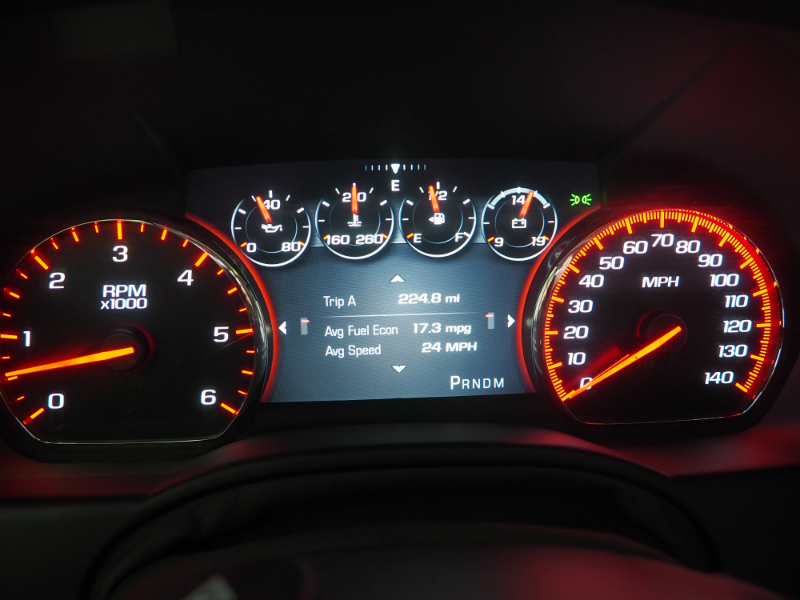 The Yukon Denali’s big V8 returned 17.3 MPG over my test week. Currently gas is cheap, but the 26-gallon fuel tank is still going to demand fill-ups every 400 miles or so, depending on how and where you drive. Any GMC Yukon isn’t a bad way to pile on miles or go out on the town, assuming you can afford the fuel, but the top Yukon Denali is quite nice. The exterior of my tested GMC Yukon Denali was finished in Crimson Red Tintcoat, a $495 option like most colors offered by GMC. 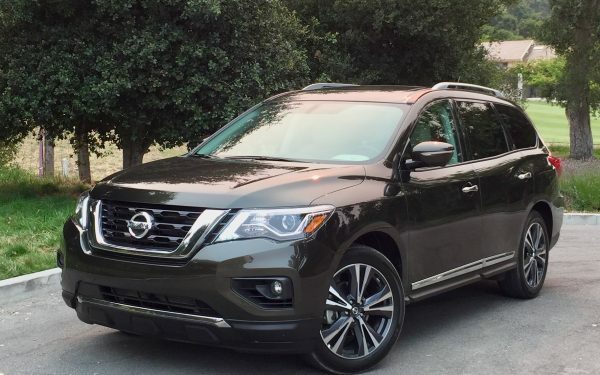 Only Onyx Black or Summit White are no-charge colors. 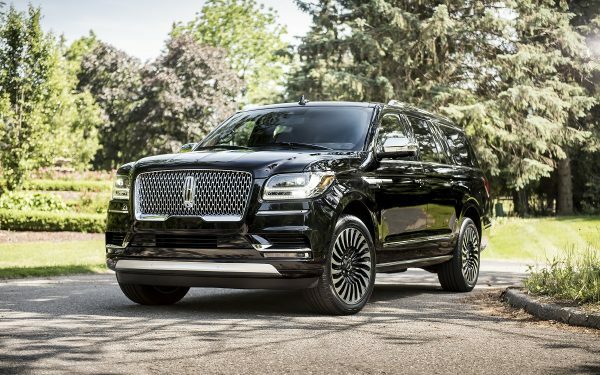 There was plenty of Denali-specific trim to complement the pretty paint, including the Remington shaver grille, HID headlights, 22-inch aluminum wheels, and plenty of chrome accents. 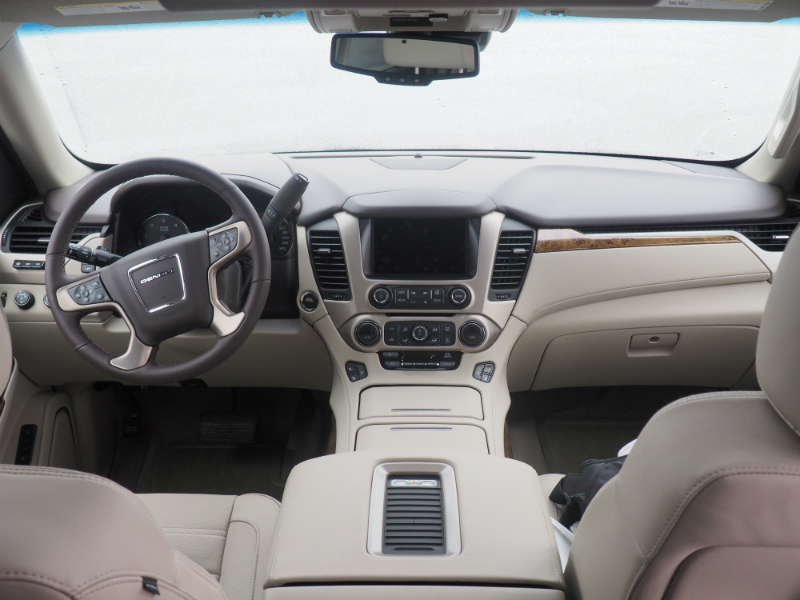 Inside the GMC Yukon Denali were veritable acres of “cocoa” and “shale” leather, to use GMC’s own color names. As you’d guess, it’s quite a luxurious place to find oneself. Seats are soft and cushy, with power adjustment, heating, and ventilation for front-row occupants. Middle-row passengers had their own captain’s chairs, with the third row being a power-folding bench seat that was kept stowed in my time with the Denali, as I had no need to carry more than four people. GMC IntelliLink remains one of the better efforts in in-car infotainment, with an easy-to-use navigation system and a logical menu structure, which is supplemented by good voice recognition software. Streaming music over Bluetooth was easy with my low-spec smartphone, and the 10-speaker Bose Centerpoint Surround Sound premium audio option made my compressed MP3 files sound remarkably good. If my phone had been one of those new, expensive things with the capability to charge wirelessly, the Yukon’s center console could do that, too. Also present was a rear-seat entertainment system with a flip-down screen viewable for passengers aft of the front row, and it DVDs or Blu-ray discs loaded into the dashboard slot. There also was an RCA plug array in the rear of the center console to connect a variety of entertainment devices. Other options included SD and USB memory slots, in case you have a your movies loaded on a USB hard drive, for instance. I was happiest to see the 2016 GMC Yukon Denali finally – but finally – getting true keyless entry and ignition. Most GM vehicles I have tested in the last few years have featured some degree of keyless entry, but many still required me to mash an unlock button on a fob just like we were doing in 1998. 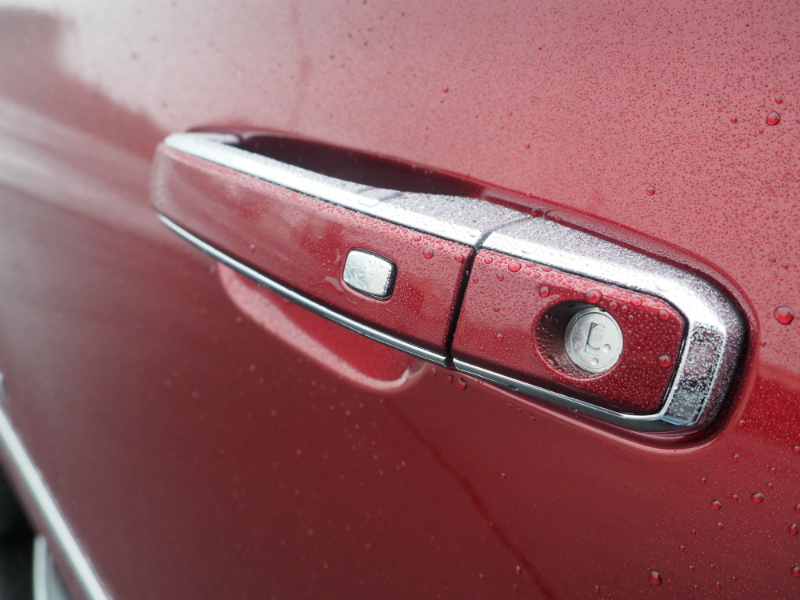 The tested Yukon Denali had a tiny, square, chrome pushbutton on every door handle that would sense the key fob in my pocket and lock or unlock the doors just like most modern keyless systems. This was also the first GM vehicle I have driven with a start button on the dash instead of a keyhole in the steering column. 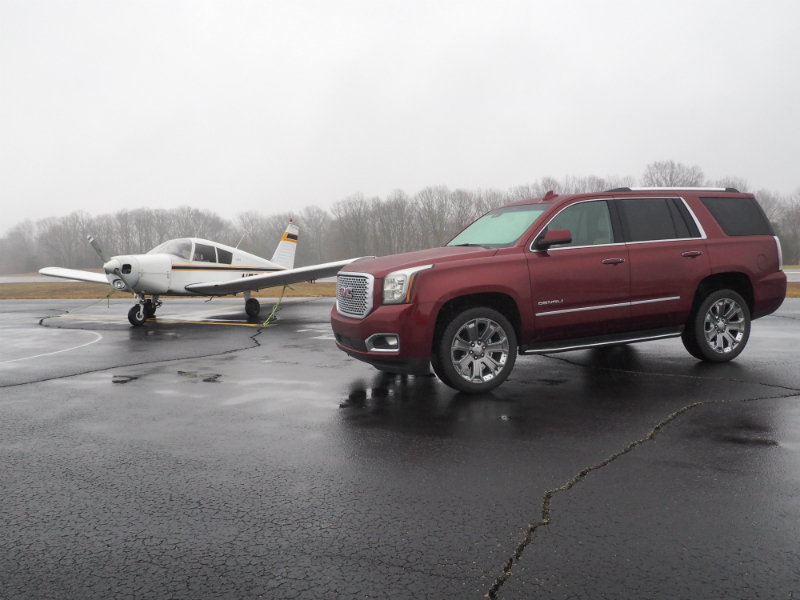 Even the $66,000 Chevrolet 2500HD High Country I tested just a couple of weeks prior to the Yukon Denali had a traditional key. It’s about time, GM. Welcome to the party. 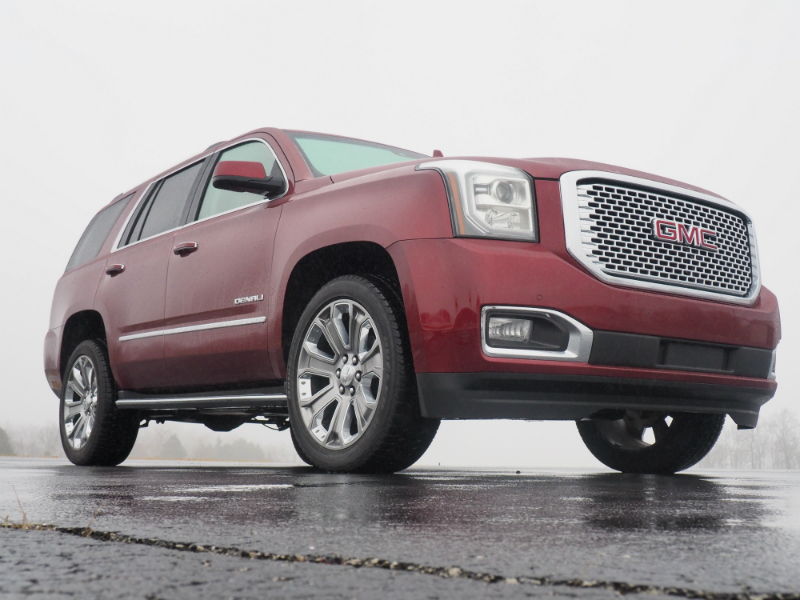 Ultimately the core audience for big, luxurious SUVs like the 2016 GMC Yukon Denali, is ballin’ and they know it, and they have the budget to show it. This GMC is also for those who want to move their families and possibly tow a trailer while being cossetted in leather and quiet luxury. For both groups, the GMC Yukon Denali checks a lot of boxes.